Lana'i is still an undiscovered gem for many visitors to Hawaii. Once owned entirely by commercial pineapple growers, the island's tourist development now includes several luxury resorts like the Four Seasons. Not a destination for party-seeking travellers, Lana'i appeals to wealthy vacationers looking for a bit of privacy and pampering (Bill Gates had his wedding here). The island is hard to get to with no direct flights from the mainland US, adding the feeling of 'getting away from it all'. Lana'i is a beautiful island with many natural attractions, including Hulopoe Bay Nature Reserve, which contains an extensive network of 100 miles (161km) of hiking trails. Other outdoor activities like scuba diving, horseback riding, golf and whale watching are possible here. The only town on Lana'i is Lana'i City, with just more than 3,000 residents. The town has most of the island's restaurants and shops, and boasts the only intact plantation town in Hawaii. 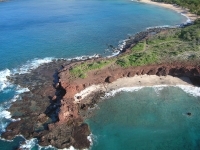 Lanai City is also home to the island's airport, which has flights to Honolulu and Molokai. We are looking for contributors for our Lanai travel guide. If you are a local, a regular traveller to Lanai or a travel professional with time to contribute and answer occasional forum questions, please contact us.